Aluminum differential mount bushing set for BMW E90 E92 E93 (Non-M3), E82 (Non-M). The stock rubber diff bushings deflect as torque moves through the drivetrain, which allows the differential to move. Upgrading your stock rubber diff bushings to our aluminum differential mount bushings will eliminate all differential movement for increased power transfer to the rear wheels. The material used for the diff mount bushing location(s) must match the material used for the subframe bushings. 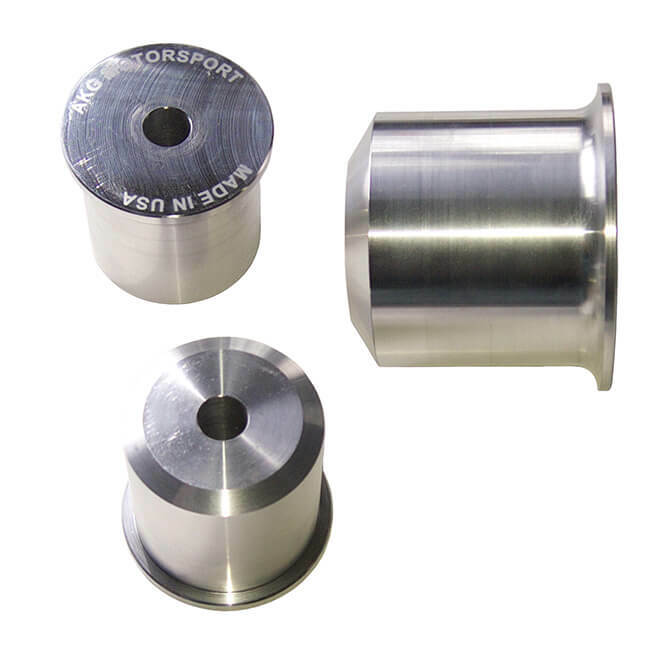 Although solid aluminum bushings are the hardest available and have a longer life span than other bushings, they are also extremely harsh and unforgiving on the chassis. Cracks may occur around the mount. Any area using aluminum bushings should be reinforced and consistently checked before/after each race. Set of three bushings. Made of solid CNC’d 6061- T6 aluminum. Engineered for a perfect fit.